Winter in Atlanta has slipped away and trees are flowering everywhere. The oaks and pecans have dangling new leaves the size of a squirrel’s ears and flaccid stamens are drifting on breezes that yearn for kite flying. Some afternoons, the warmth nudges towards eighty and occasionally dawn dips below forty. 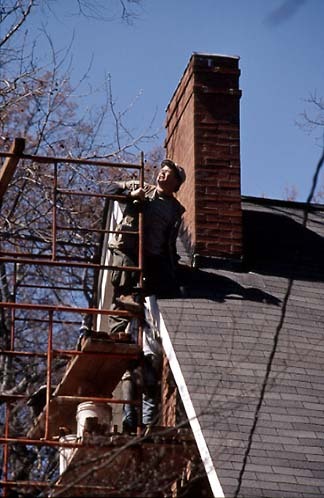 The chimney I've been restoring is on the gable end of a tall cottage style house. 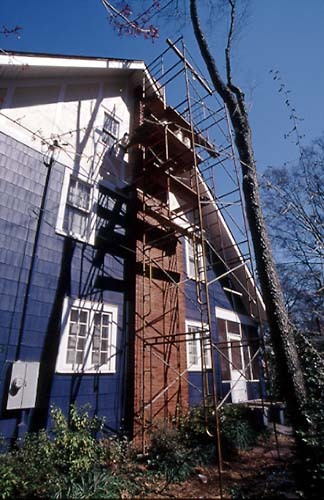 My scaffold tower reaches 40 feet in the air, pretty high for residential. The mortar is red and matches the brick. I've been chiseling out a trench in the chimney to put in flue tile, a terra cotta pipe that will contain the smoke. 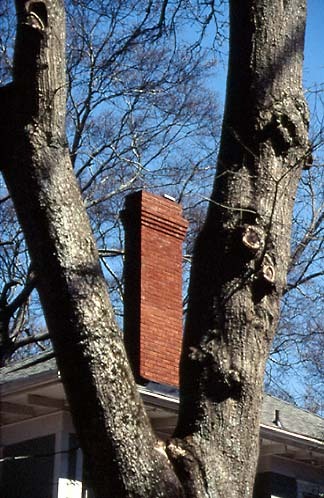 I tested the chimney with a fire and it leaked smoke into the unfinished attic. The steep roof will one day make a cool home office and the inside of the chimney has oozed mortar joints. The owner hoped to save the effect of the exposed brick and oozed mortar joints and he recoiled when I suggested stuccoing the brick to seal the joints. Access was relatively easy on the outside of the house and so I opted to chisel out the brick and stucco the flue from the inside. The technique I used was perfect for the old mortar which was stable until hit with a thin capping chisel. I used a two-pound sledgehammer and probably swung the hammer three thousand times a day. Tink tink tink. 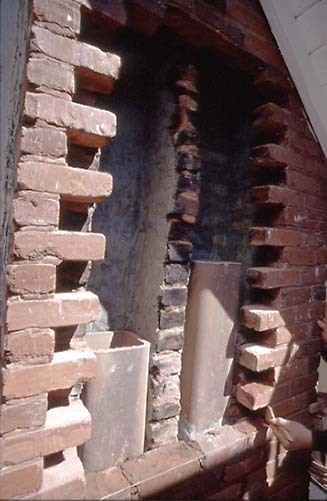 I could chisel out six feet of brick, smear cement inside the flue, put in the tiles and close up the opening using the same brick, all in a seven-hour day. It was slower than using a bull saw, but still profitable. The real reward was when Chris, the owner and a work-at-home CFO, came out after we had finished about twelve feet, looked at us working and asked (after saying it looked great) when we were going to do the work below us. I climbed down the scaffold and showed him where we started and he said it matched perfectly, he never would have found it. I'll play back that flattery in my head for years to come. Such sentences make a restoration mason swoon. The scaffold was harrowing, though. Scaffold is set up walking on a 2x10 plank. Each end frame weighs around fifty pounds. I use a rope and pulley on a cedar 4x4 to pull things up and I have a ground man whose been working with me off and on for 20 years. He's occasionally an actor and has gotten work for TBS. Chimp-like features and 140 pounds soaking wet, he's wiry and strong and good company. He wintered in the mountains of North Carolina and was glad to get some working a city that's warm, though he landed in town more broke than usual. We're both almost fifty and have lost a good bit of youthful strength and groan like old men in the morning as we sip our coffee and gripe about aches and pains. One day in particular that left us both in an ice pack and heating pad frame-of-mind was the day I took down the tower. Through years of doing this kind of work, I've become fairly free of a fear of heights, and my balance is extraordinarily good, but taking apart scaffold on a plank is a task that gets my complete attention. When I lift one end frame from the one below it, the whole tower shakes and distributing the cantilevered weight to the plank takes thousands of muscle movements on the soles of my feet. Moving down the plank to a lower section requires a stretch to grab the middle of the board and resting the plank on my forearm. The hand and arm that reaches to grip the tower is stretched and locked. I move like a sloth in forced calm. In more chipper moments, I sing, "Will I still do this, can I still do this when I'm sixty four…"
One move really wiped me out, though. I had to lie on my stomach while holding an end frame. The process of lying on that plank with the extra fifty pounds in my arm took all I had. When I finally climbed to the ground to take apart the last section, I had done a day's work in about two hours. We loaded the scaffold and lumber on my truck and brought back to my yard (the job is just a few blocks from my house) and unloaded it. We ate lunch in rocking chairs on my front porch and talked about the peculiar sense of empowerment from work of that intensity. I won't waste the reader's time with descriptions of how stiff I was the next day, but in my mind I have a wealth of metaphor.